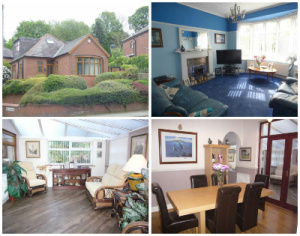 A good sized detached dormer bungalow with four bedrooms, situated in a popular and convenient location. Enjoying a corner plot, the property is also elevated from the road providing a good degree of privacy. Briefly comprises: Large entrance hall, generous lounge with bay window, fitted kitchen, dining room, family room, utility room, bathroom, four bedrooms and a wash room. EPC – E. Externally, the property has a mature garden to the front, and to the side is a parking bay and patio area. 173 Manchester New Road in Alkrington, Middleton, M24 1DE is available to view on Saturday 27th August between 12pm and 1.30pm with no appointment required.